Brian Elliott has won 13 consecutive home games, extending a franchise record he set with a 5-0 shutout against Los Angeles on Thursday. 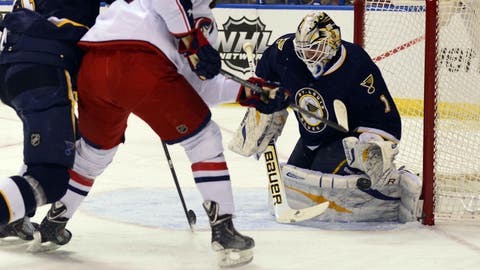 ST. LOUIS — Patrick Berglund scored twice and Vladimir Sobotka and Alex Pietrangelo each had a goal and an assist as the St. Louis Blues beat the Columbus Blue Jackets 6-2 Saturday night for their fifth straight win. Columbus, which led 2-0 lead after the first period, has lost three of four after winning three in a row. Maxim Lapierre gave St. Louis its first lead at 3-2 with his fifth goal just 94 seconds after Sobotka’s sixth goal tied it at 17:29 of the second period. St. Louis got on the board about seven minutes into the second period when Barret Jackman’s shot from the right side glanced off Berglund. The puck hit the far post and trickled past Curtis McElhinney. His second goal came 17 seconds into the third when he deflected a pass into the goal. Jaden Schwartz added his 15th goal about midway through the third to make it 5-2. He’s scored in seven of his last eight games. Pietrangelo finished the scoring with about six minutes remaining. St. Louis goalie Brian Elliott has won 13 consecutive home games, extending a franchise record he set with a 5-0 shutout against Los Angeles on Thursday. McElhinney stopped 31 shots. Elliott faced 23, making 21 saves. Mark Letestu gave the Blue Jackets a 2-0 lead midway through the first. His shot from outside the left circle hit a Blues defender and popped over Elliott for his second goal of the season. The Blue Jackets took a 1-0 lead four minutes into the game. Artem Anisimov, standing alone in the middle of the zone with his back to Elliott, took a pass from Brandon Dubinsky. He whipped around and slapped a shot past Elliott, who didn’t move as if he didn’t see the shot. It was the 12th goal of the year for Anisimov. NOTES: St. Louis D Jordan Leopold saw his first action since being activated from injured reserve. He was out since November with a torn ligament in his right hand. … Blues G Jaroslav Halak missed his fourth consecutive game with flu-like symptoms. He got pulled after a period Dec. 28 against Chicago before sitting the next four, all St. Louis wins. … St. Louis RW David Backes returned after missing three games with an upper-body injury and had two assists.